Get ready, because the snowpocalypse is back. 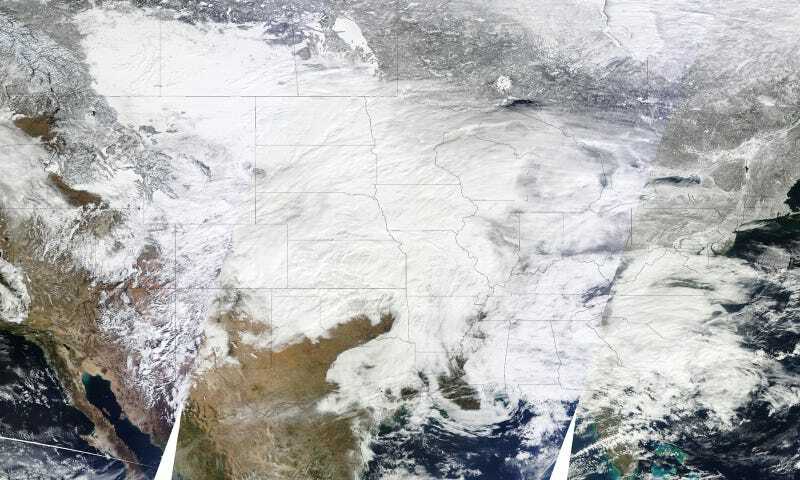 This snow storm system is huge. NASA Goddard has released this amazing image, showing how it looks from space—bloody scary, that's how. A large swath of blizzard warnings, winter storm warnings, freezing rain advisories, winter weather advisories and winter storm watches are in effect, stretching from New Mexico and the Southern Plains northeastward through the Midwest and into the upper Mid-Atlantic and New England. According to NOAA, the storm will hit really hard over Texas tonight, "and intensify rapidly as it moves northeast into the Ohio Valley Tuesday night and Wednesday, then eventually re-form off the mid-Atlantic or New England coast late Wednesday." In other words: Expect extreme travel disruption and lots of snow zombies over the next 48 hours. Got any great pictures of the storm in your area. Send them to jesus@gizmodo.com.